Driving the Beaverette: off road! Early 2016 Historic Engineering finished the restoration of the rare Standard Beaverette, belonging to the Nationaal Militair Museum. One of the main reasons for restoring this vehicle to running condition, was the role it was meant to play in a major event at the NMM. 2016 marks the 100th anniversary of the tank. For this occasion the NMM organised the first "Tank Event" of its kind at Soest, in August this year. As described in the article in Classic Military Vehicle (November 2016 issue), the vehicle had been tried and tested on normal roads without any problem. Luckily, after a "dry run" some weeks before, the Beaverette performed remarkably well. Even though the 2,5 ton vehicle is only two-wheel drive, and the engine capacity of the Standard 14 engine is only 1,8 ltr., the combination of low gearing and fat low-pressure sand tires did the trick. Drivers seat view upon entering the arena! While the track was flat and solid during the test drive, on the actual day of the first show the other participants, being all sorts of tanks, had already had a go at the track! It was therefore that I had to drive off, in to the great unknown, and hope that we, the director in the turret and me, didn't get stuck in deep sand in front of 5,000 spectators! Nationaal Militair Museum director Hedwig Saam, speeching from the gun turret of the Beaverette. Welcome to our new facilities. We have recently moved our offices and workshops to a fantastic new location! Even though it was only next-door, a lot of hard work has been put in to getting everything finished to the highest possible standards. When you come and visit us, you first enter the fresh and roomy reception area at the front of our offices. Turn left, and you find yourself in the spacious air-conditioned textiles department. The vacuum table has now also been placed directly in the workshop. The large objects workshop leaves nothing to be required. With a free floor space of about 200m2 and two gantry cranes with a total capacity of 4 tons we can take on some rather hefty challenges! The well equipped machine workshop allows for all sorts of treatment for metals and wood. Why not come and see for yourself? Feel free to contact us directly so we can plan your visit. 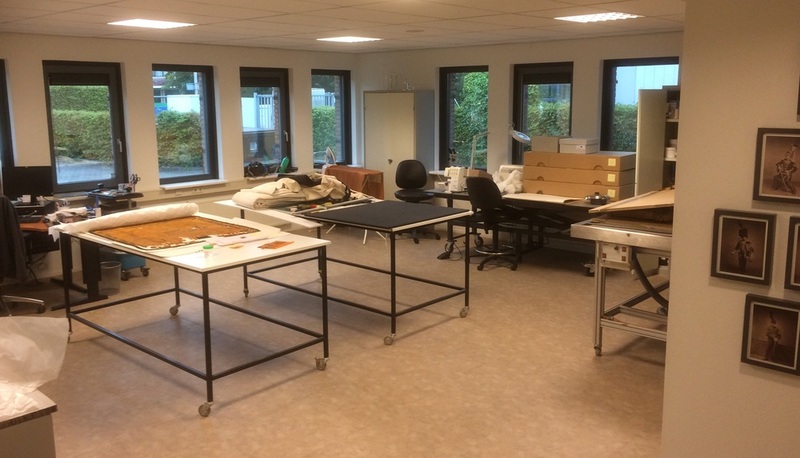 Besides actual conservation and restorations, we offer a wide range of services for museum collections as an important part of our activities. Because of our extensive experience in handling large museum objects such as aeroplanes, we regularly either assist in storage projects, or handle the project as a whole. One of our major customers, the Nationaal Militair Museum, has chosen to maximise the available storage space by actually stacking aircraft, using custom made containers. Today our team placed one of two aircraft (a Harvard, next up is a Beaver) in a container, together with it's (now detached) wings and tailplane. Great care is taken to protect the original rubber tires, by placing bespoke supports under the main wheel struts and tail wheel. After further securing the airframe and wings to the container frame, the container as a whole can eventually be moved and lifted by a heavy forklift. In the background a good example of previously crated objects; a Fokker S-11 trainer and Alouette II helicopter on top of a container, holding a Lockheed T-33 Shooting Star. This method means an extra third of the original floor space is won! Result. Two aeroplanes using as little floor space as possible. The whole exercise was executed well within the planned 3 day Period. Today we received two beautiful objects for preservation and long-term storage. These vehicles, belonging to the "Museum voor Communicatie", The Hague, have been in their collection ever since the start of the museum, in 1929. This means these have been untouched ever since, and are therefore in unique original condition. The vehicle above is a 1925 post van, based on a French made "Chenard et Walcker" U5 chassis and engine. The second vehicle is a mobile phone- and telegraph station, with impressive interior and full telegraph installation. This too is based on a French made chassis, "De Dion Bouton". A more detailed look on both vehicles will follow later. This particular example of a Fi-103 flying bomb had been used by the Dutch Army for instructional purposes. It had large sections of the hull cutaway, the engine was split in half, and the nose section was missing. The goal was to re-create an accurate impression of the original V1, retaining as much of the original material as possible. Domein Raversijde is a unique intact part of the WW2 'Atlantic Wall' at Oostende, Belgium (Provincie West-Vlaanderen). This 60 cm. searchlight was stood outside in sea-side salt air conditions for the past 20 years, and was to be restored as part of the renovation of the whole site. The object is planned to be exhibited indoors after restoration. This project included organising recovery and transport.